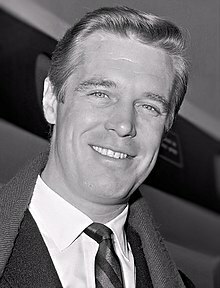 George Peppard, Jr. (October 1, 1928 – May 8, 1994) was an American movie and television actor. He had a major role early in his career when he acted with Audrey Hepburn in Breakfast at Tiffany's (1961), but he is probably more well known for his role as Col. John "Hannibal" Smith in the 1980s television show The A-Team, where he was the leader of the group, who was often smoking a cigar. Peppard had lung cancer and died of pneumonia. This page was last changed on 28 November 2018, at 17:33.